Bangalore- 08 December, 2013: The Corporation Bank, one of the oldest banks of India, has contributed one meal distribution vehicle to The Akshaya Patra Foundation, the world's largest NGO-run school mid-meal program which currently feeds over 1.3 million children across the country every day. Shri S R Bansal, Chairman and other top officials of Corporation Bank flagged off the mid-day meal vehicle along with the presence of Shri Madhu Pandit Dasa, Chairman, The Akshaya Patra Foundation. 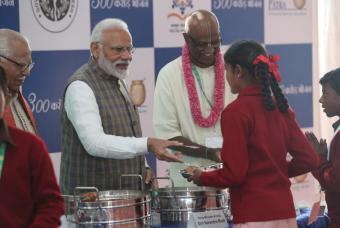 The inauguration was followed by a visit to the Akshaya Patra kitchen to understand the process that caters to the needs of millions of children on each school working day.The custom-designed vehicle is insulated to maintain optimal temperature, is dust-free and helps to retain the freshness of the meals. The meal delivery vehicle will help transport hot, nutritious meals from the centralized kitchens to about 4,000 children daily in 40 schools each day. Speaking on this occasion, Shri Madhu Pandit Dasa, Chairman, The Akshaya Patra Foundation, said, "Corporation Bank commenced its partnership with Akshaya Patra back in 2009 and till today they have continued their support which enables us to reach more hungry children in India. We hope to continue and strengthen our relationship to reach 5 million children by 2025 across India." Responding to this, Bansal said "Mid-day meals play a stimulatory role for children to go to school and continue their education. Meals also provide necessary nutrients for the physical and mental growth of a child. We are extremely humbled and happy to continue our support to the Akshaya Patra Foundation." The Akshaya Patra Foundation implements India's largest NGO led mid-day meal programme in partnership with the Government of India, and Governments of 9 states, feeding 1.3 million children every school working day in 19 locations across India. Corporation Bank is a public sector banking company headquartered in Mangalore, India. The bank has pan-India presence with 6,677 functional units comprising 1869 branches, 1425 ATMs & 3545 branchless banking units as of 31st March 2013.